Refractors have always been found better suited than reflectors to the ordinary work of observatories�they lend themselves with far greater facility to purposes of exact measurement. The 19th century saw an expanded scope for telescopes using lenses (refractors) as the professional astronomer's most important tool. As optical technology improved, the refracting telescope became a rugged and precise instrument. It was well suited for the research interests of scientists, who were mainly concerned with accurately measuring the positions and relative movements of stars. Astronomers' desire for ever bigger telescopes caught the attention of wealthy American benefactors. By the end of the century, Americans boasted the two biggest telescopes in the world. Just as important for cosmology was astronomers' gradual acceptance of astrophysics, which merged physics theory with the study of stars. The triumph of the refracting telescope as a serious research tool depended on technological progress. Glassmakers had to perfect the manufacture of high-quality optical glass, and opticians had to figure out ways to avoid the smearing of colors by lenses (chromatic aberration). Until the early part of the twentieth century, glassmaking was more a craft than a science. Optical glass in particular had to be exquisitely free of defects and residual color. For example, iron impurities in the sand used for glassmaking could tint the glass, while tiny bubbles or other defects could render the glass useless for lenses. A major advance in overcoming the chromatic aberration inherent in refracting lenses came in the 1750s. An English optician, John Dolland, learned of earlier studies that showed how to the eliminate nearly all the chromatic aberration. The trick was to combine a concave lens made from a leaded ("flint") glass with a convex lens made from a glass with a slightly lower density. The colors dispersed by the first lens were bent back together by the second. These came to be called achromatic lenses. Dolland received a patent for his design, but the poor quality of the flint glass available at the time limited its usefulness. One of the great obstructions to the construction of large achromatic telescopes is the difficulty of procuring large disks of flint glass of a uniform density of good color and free of veins." In the early 19th century, advances in the production of optical glass led to better refracting telescopes. Between 1784 and 1790, Pierre Louis Guinand, a Swiss craftsman, taught himself the basic skills of glassmaking and began to experiment with optical glass. His first attempts were unsatisfactory. Not until the late 1790s was Guinand able to make high-quality lenses as large as six inches. Guinand's big breakthrough came in 1805, when he replaced the long wooden rods used to mix the hot glass in the furnace with stirrers made of clay. The new stirrers brought unwanted bubbles to the surface and mixed the glass well enough to produce a nearly flawless material. Guinand was enticed to Munich by a German optical firm, where he passed on his secret to Joseph Fraunhofer, an apprentice optician. Fraunhofer, skilled in both mathematics and optical design, was the first scientist to examine the dark lines that mark the spectra of light from the stars. After Guinand moved back to Switzerland, Fraunhofer continued to experiment with glassmaking and lens design. Fraunhofer's efforts bore fruit in several excellent refractors, built before his death in 1826 at the age of 39. One of these was a 9.5-inch telescope at Russia's Dorpat Observatory, installed in 1824 by F.G. Wilhelm Struve. The famed Russian astronomer commented that upon seeing the instrument, he was unable to determine "which to admire most, the propriety of its construction� or the incomparable optical power, and the precision with which objects are defined." 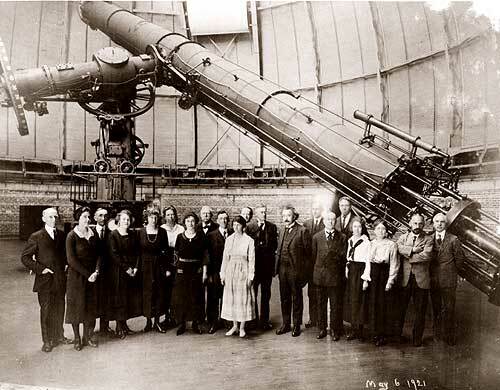 Struve and other astronomers used the telescope to survey over 120,000 stars. The 14-foot long "Great Dorpat Refractor" was noted not only for the high quality of its lenses but also for its mounting. It was the first example of what became known as equatorial mounting. It had a "polar" axis which was accurately aligned with the rotational axis of the Earth (that is, the axis pointed, roughly speaking, towards the North Star). Together with a "declination" axis, at a right angle to the polar axis, this allowed the telescope to be rotated toward any part of the sky. The great advantage of Fraunhofer's equatorial mounting was that the polar axis was continuously rotated by a clock mechanism. It was driven at precisely the rate that counteracted the apparent daily movement of the stars across the sky. Thus the telescope tracked stars automatically. Fraunhofer's innovation became part of the standard design of telescopes in the 19th century, allowing astronomers to peer much more easily into the night skies. The clock-driven equatorial mounting proved essential when photography was introduced into astronomy in the latter part of the 19th century, for it made possible lengthy exposures of photographic plates. Techniques for making high-quality glass and lenses spread to France and England. The English government, for example, saw the potential for a profitable industry, and asked scientists to apply their skills to improve the nation's optical glass production. Meanwhile, Fraunhofer's success in making astronomical instruments helped create a German optics industry which led the world for more than half a century. In 1825, President John Quincy Adams complained that while European nations could boast of having over 130 "lighthouses of the skies," America had only a few observing facilities in private hands. By the end of the century, this was remedied as Americans financed a tremendous surge in telescope building. The first observatories built in the U.S. were equipped with telescopes from Europe. 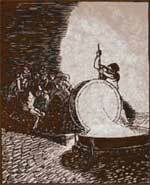 An example was the new 15-inch refractor dedicated in 1847 at the Harvard College Observatory. Donations from Boston citizens paid for it. 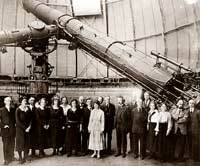 Dubbed the "Great Refractor," it was the largest refractor in the world for twenty years. The Harvard instrument (like a similar one at Russia's Pulkovo Observatory) was made by a German firm. Alvan Clark (center) with his sons Alvan Graham Clark (left) and George Bassett Clark (right). The first telescope to surpass the Russian and Harvard 15-inch telescopes was made not by a European firm, however, but by an American. Alvan Clark, along with his sons Alvan Graham Clark and George Basset Clark, became the world's preeminent makers of telescopes in the second half of the 19th century. Their company, Alvan Clark & Sons, built instruments for almost every American observatory as well as some overseas. Five times the Clarks beat their own record by making the lens for the world's biggest refracting telescope. Some are still in operation today. U.S. Naval Observatory's 26-inch refractor in Washington, D.C. The Lick 36-inch telescope. Lick's body is interred in the concrete under the telescope. The biggest commission of the elder Clark's life came in 1880. The purchaser was James Lick, a San Francisco businessman without an heir who decided to immortalize himself by funding the world's biggest telescope. After Lick's death in 1876, Mount Hamilton near Santa Cruz, California, was chosen as the site for Lick's monument. Alvan Clark & Sons were given the contract to produce a 36-inch lens for the giant telescope. A French company made the blank glass discs (it took them 19 tries over three years). The grinding and polishing was finished in 1885. 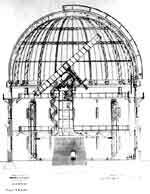 The telescope's dome was advanced for its time, with a design that compensated for the expansion and contraction of metal with changes in temperature. The circular floor of the dome rises and descends through approximately seventeen feet to follow the eyepiece of the 58-foot-long telescope tube. Alvan Clark died at the age of 83 in 1887, the same year that the Lick 36-inch refractor was dedicated. The excellent quality of the 36-inch telescope, combined with Mount Hamilton's excellent observing conditions, helped Lick Observatory become one of the world's premier astronomy institutions. Lick had also helped start a trend of building major American telescopes under the relatively cloudless western skies. 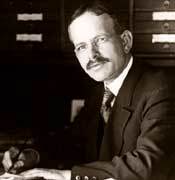 Yerkes will "lick the Lick"
George Ellery Hale was perhaps the greatest American science entrepreneur of his time. He inspired, organized, and helped find funding for three of the most important observatories in the history of astronomy. In 1892, the 24-year old Hale was a recently married associate professor at the University of Chicago, an ambitious young scientist in an ambitious young institution. That October, he accompanied University of Chicago president William R. Harper to visit the offices of Charles T. Yerkes. Yerkes was a Chicago tycoon who had made his fortune through streetcar and railroad franchises. His unsavory business practices had earned him the scorn of many Chicago residents. Recently married to a chorus girl, Yerkes was interested in his social position and legacy. One path to higher community standing was to promote science in a splendid fashion. Hale and Harper left Yerkes' office with a mandate to build "the largest and best�telescope in the world�and send the bill to me." Local papers ran headlines like "Street-Car Boss Uses a Telescope as a Key to the Temple Door" and boasted the new telescope would "lick the Lick." The whole enterprise will cost Mr. Yerkes certainly half a million dollars. He is red hot and does not hesitate�It is a pleasure to do business with such a man. Hale set himself to organizing what would become Yerkes Observatory. He knew that Alvan Clark & Sons had a partly finished lens, 40 inches in diameter, left over from another telescope project that never materialized. A few days after the visit to Yerkes, Alvan Graham Clark arrived in Chicago and agreed to finish the 40-inch lens for the new observatory. The noted instrument firm Warner and Swasey would make the telescope mount. Alvan Clark & Sons finished the lens (actually an achromatic pair, one lens of crown glass and one of flint glass) in October 1895. It weighed 500 pounds and had a focal length of 62 feet. In 1897, the lens was shipped to Williams Bay, Wisconsin, the chosen site of the new observatory. The telescope with its moving parts and counterweights weighed over 20 tons, yet it was so well-balanced that small motors could easily move it to point at any part of the sky. As at Lick, astronomers could raise and lower the entire floor of the observatory in order to reach the eyepiece. Astronomers who used the new telescope were delighted with its quality. 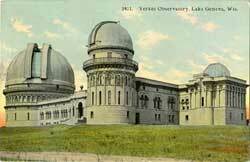 Hale meant to devote Yerkes Observatory to a relatively new branch of astronomy, astrophysics. Breaking with the established classical astronomers, who mainly concerned themselves with the positions and movements of the stars and planets, Hale was determined to promote the study not just of how celestial bodies moved, but of what in fact they were. Hale's ambition is reflected in the architecture of Yerkes Observatory. The giant 40-inch telescope was not centrally located in the observatory but in a dome off in one wing. Much of the observatory's floor space was laboratory space. This was devoted to photography and spectroscopy, two new areas of physics that would increasingly dominate astronomers' research in the 20th century.